CWA President Chris Shelton traveled to Germany this week to meet with members of the German parliament and speak to Deutsche Telekom's Group Works Council about the efforts of T-Mobile US workers to join together to fight for better working conditions and a fair return on their work. Deutsche Telekom (DT) is T-Mobile's parent company and the German government is a major shareholder in DT. While DT respects the freedom of working people in Germany to join together in a union, T-Mobile US has illegally interfered with efforts by workers in the United States to organize. Members of the German labor union ver.di have built a strong partnership with T-Mobile US workers who are fighting for a union voice and have joined CWA in calling on T-Mobile to respect the rights of U.S. workers. CWA President Chris Shelton traveled to Germany to win support for T-Mobile US workers to join together to fight for better working conditions and a fair return on their work. 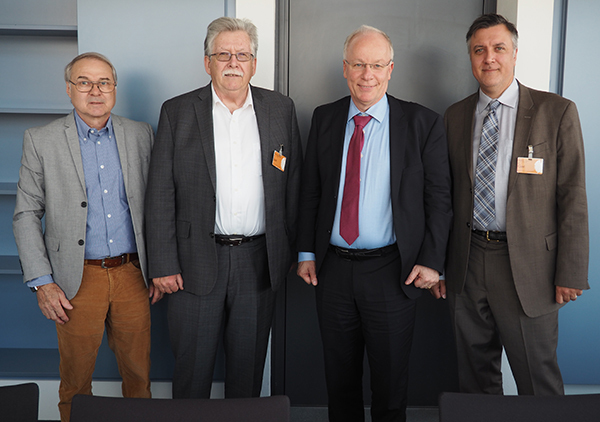 From left: Ado Wilhelm, ver.di; CWA President Chris Shelton; Dr. Matthias Bartke, Chairman of the Committee on Social and Labor Issues of the German Parliament; CWA Chief of Staff Jody Calemine.